Over the weekend The Rib Rabbi and I, along with our accomplice Nate “Ol’ Hickory” O’Keefe, volunteered at a barbecue-themed fundraising event. More on the event soon, but that’s a separate post. While at the event, we “discovered” a local BBQ joint we’d never heard of: Mama Jean’s Bar-B-Que Shack (as is common with barbecue joints, alternate spellings abound, with “Mama Jean’s BBQ Shack” and “Mama Jean’s Bar-B-Q Shack” also featured in their marketing materials). 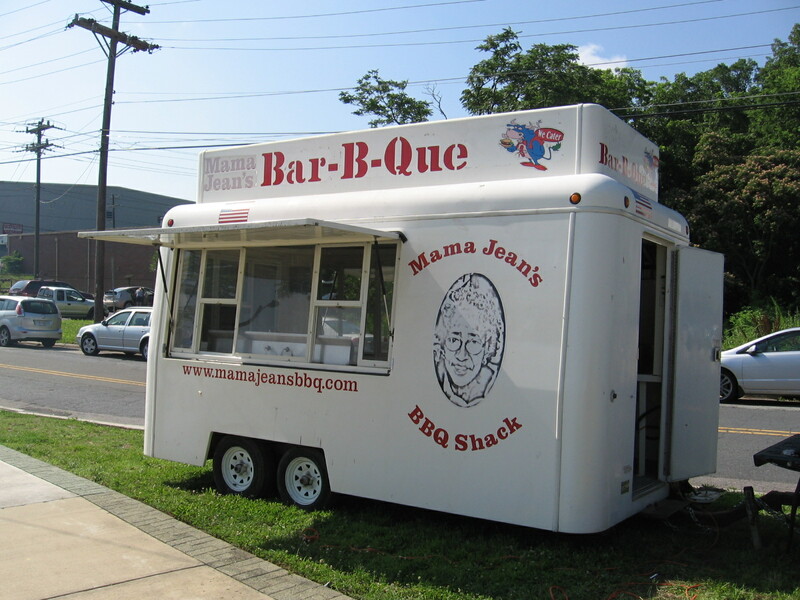 Better yet, Mama Jean’s operates out of a truck, which as far as we know is unique for BBQ in food truck-rich Durham; other examples exist elsewhere in NC, such as Fatback’s BBQ & Rib Shack in Fayetteville. Despite being set up squarely in the middle of a long row of BBQ cooking teams, the guys from Mama Jean’s caught our attention because they were the only ones using charcoal and wood instead of propane. Of course, they also had that BBQ/Bar-B-Q/Bar-B-Que truck of their’s doubling as a hard-to-miss billboard. Alas, we arrived at the event too late to sample Mama Jean’s cooking but we vow to check it out soon and report back. We did get a chance to chew the proverbial fat with the Mama Jean’s crew. They were nice guys who clearly care about ‘cue and were proud to be cooking over wood/charcoal. They told us that they are working on opening a permament brick and mortar location soon, but for now you should be able to find their bar-b-bus parked near the corner of Angier and Driver Streets in Durham a short drive east of downtown. They also would be happy to help you with catering your next event. See their website for details and stay tuned for our patented BBQ Jew’s View review coming soon.